Behind Green Eyes: Parcel Motel - What is it? In 2013 I was contacted by the lovely folks at Parcel Motel who offered me the chance to try their service and receive a complimentary gift to celebrate their first year in Ireland. I went along to my local depot and picked my welcome pack up. I then did what all normal people do and painted my nails in honour of their first birthday. Since then, I've been a regular user of the service. If you've never used Parcel Motel, or find the whole idea a bit scary, I'll break it down for you. Parcel Motel is basically a service that makes it possible (and easy) for customers in Ireland to pick parcels up from a locker at a time that suits them. This will be really useful if you are constantly missing packages or couriers - you can divert them all to your Parcel Motel address and pick them up after work or even at night. I've used it for an order from Schuh before just because I wouldn't be around for a courier. 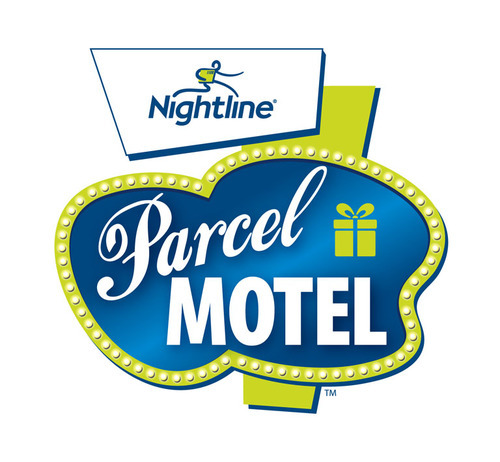 When you register, you are provided with a unique Parcel Motel ID and two addresses - a Dublin one, and a UK (NI) one. You are free to use either one, depending on your order. This means that you can order items from the UK, have them delivered to your UK Parcel Motel address, and then couriered to your nearest Parcel Motel depot in the Republic by Nightline couriers. When your item arrives, you'll get a notification with a pin number.You can then go to your depot and follow the really easy instructions on-screen, inputting your ID & pin when asked. One of the many different-sized doors will then pop open, and you can take your parcel home. Parcel Motel charge €3.95 per stay. A stay is counted as 48 hours. For example, if your parcel arrives on a Monday at 7am, you have until 7am on Wednesday to pick it up without incurring extra charges. On items that offer free UK postage, the €3.95 is all you will pay. If you want to send something from one Parcel Motel locker to another instead of using the Post Office, rates start at €4.50. When you're ordering from the UK, just put your name as usual, then instead of your own address, put in your Parcel Motel ID and your UK Parcel Motel address. Don't worry about items that need to be signed for - there will always be someone there to provide a signature if needed. I've put together a list of 5 examples for you - it's a really worthwhile service and there is now a depot in every county in Ireland. Visit www.parcelmotel.com for a list of locations and FAQs. A-England Nail Polish: Free UK Shipping, do not ship overseas at present. Use Parcel Motel to order from Ireland. Amazon: The minimum spend for Free Super Saver Delivery to Ireland is £25. Use Parcel Motel to get Free Super Saver Delivery on smaller items without having to make it up to £25. You can also now take advantage of Amazon Warehouse deals. M.A.C: The UK M.A.C site is up-to-date and offers free delivery on orders over £30. Cath Kidston UK: The UK delivery charge under £50 is just £3.95 - compared to a usual £10 for international. Use your UK address! Latest in Beauty: They have the most fabulous beauty boxes, but they don't ship to Ireland. Use your UK address to avail of some great offers. Some have free postage, others are £3.95. Sephora: Possibly the best one, Sephora in the US now ship to the UK. You can order via Parcel Motel - some brands don't ship overseas but there are still lots to choose from - Becca, Kat Von D, Too Faced, Sephora own brand, Bite Beauty are only a handful of what's available. It sounds like a good system, we don't have anything like that here. If you miss the postman or courier you pick your parcel up the best way you can - in business hours. It's a really good idea and I'm impressed at the way they've rolled it out pretty much nationwide, we never usually have access to services like this because we're so rural. That's what puts me off ordering larger things online, the hassle of having to go pick it up! Love the nails, you are super talented! I haven't tried this but definitely would if I fall in love with something that won't be delivered to Ireland. Thanks Emma! It's really handy, just thought even for Lush orders around Christmas it'll knock a good few euro off the postage charges! Great idea with the nails! They look fantastic! I love your style and you. Keep up the great blogging girly!! I've signed up with Parcel Motel a month ago but didn't receive any welcome gift. :-( but the service is amazing I've just used them for the second time.